The TRD Supercharger is advertised to be maintenance free and have a service life of 100,000 miles. I have been told by the folks at Magnuson who kit the supercharger for TRD that there are a couple things you can do to make it last much longer. You can change the oil in the nose drive and replace the nose drive with an overhauled unit. You can change the oil in the nose drive. There is four ounces of a special synthetic oil in the nose drive to lubricate the gears and the bearings that support the input shaft. This oil does not require changing for 100,000 miles, but changing it sooner is always a good idea. You can get an oil kit from Magnuson for your model supercharger. The oil kit includes a pre-measured four ounce bottle of oil and a new drain plug. The first generation TRD Supercharger like I have is mounted upside down from the way they normally are. Because of this the supercharger will have to be removed from the engine so the drain plug can be removed and the old oil drained out. The best time to do this is when ever you remove the supercharger for some reason like installing larger injectors. On the newer, second generation supercharger the drain plug is on the front of the nose drive near the input shaft. The plug can be removed and the old oil sucked out with a suction machine. Then all you have to do is pour in the new oil and install the new drain plug. When I checked out some of the Grand Prix message boards, I found that were recommending changing the supercharger oil every 15,000 to 30,000 miles. I would think that a 30,000 mile interval would be a very good idea. Here is a picture of the supercharger after the nose drive has been removed. The other thing that Magnuson recommended was to replace the nose drive every 60,000 miles. They say that as the supercharger exceeds 60,000 miles the bearings in the nose drive start to wear and shed metal. 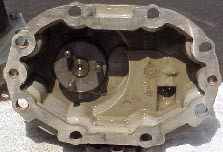 This metal floats around it the supercharger oil and can cause damage to the main bearings that support the supercharger impellers. When these bearings fail the whole supercharger will then require overhauling. This is what the inside of the nose drive looks like once it has been removed. You can obtain an overhauled nose drive from Magnuson with all new parts in it. The only thing that is reused is the housing. The overhauled nose drive comes with everything you need to replace it, the nose drive, oil, a new shaft coupler, and the needed sealant for the casing. To replace all you have to do is remove the supercharger from the engine so the oil does not spill all over the place when you split the case and remove the bolts that are around the edge of the nose drive and give a tap to break the seal. (I know of one guy with a second generation supercharger that was able to replace the nose drive without removing the supercharger from the engine.) Pull it off and then clean the sealing surface really well so the sealant will stick and seal. Then apply the sealant around the edge and install the new nose drive. Then pour in the new oil, install the plug, and reinstall the supercharger. Check with Magnuson for the proper bolt torque for your model supercharger. Other things you may want to do on a regular basis is check around the input shaft for signs of leaking oil, check the belt tension and condition, and make sure the bypass valve is working properly and not sticking. I have installed two second generation supercharger on found that the travel stop set screws where not properly adjusted causing the valve to over travel and stick. The simple way to check the bypass valve is to look at its position when the engine is off, then start it and the valve should move to the opposite position. When you shut off the engine it should move back to where it was when you started. 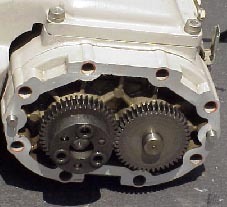 Any time you remove the belt, turn the input shaft by hand in the same direction that the engine turns it. It should turn smoothly with no roughness felt in the bearings. It is a very good idea to obtain an extra supercharger belt and carry it with you in the truck just incase yours fails. This is not an item that is normally stocked at Toyota dealers and it may take a few days to special order one in from TRD and you would not want to get stranded. I have also checked with several of the larger auto parts stores and none of them stock that size belt. If you are wondering it is a 62" four ribbed belt and the original ones were made by Dayco for TRD.